With all the ballyhoo about Jose Reyes’ headfirst slide into third last night and the ensuing discussion about whether it’s safer / smarter / faster to slide head- or feet-first, here are some interesting points. First, a mechanical engineer came to the conclusion that sliding head-first was faster. Though, other researchers — including a physicist — saw no significant difference between the two methods. “I never slid headfirst, ever. 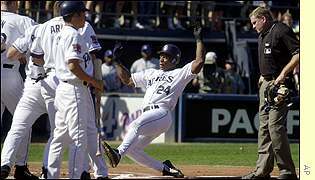 Nowadays they all do,” said Lopes, who stole 557 bases in his 16-year playing career. “Back in the day, only slow guys did it. Maybe now it’s because of swimming pools. Kids learn to dive headfirst. That’s the only thing I can think of. I remember the first guys I would define as basestealers to do it were Frank Taveras and Omar Moreno. Later on, Rickey [Henderson] would do it, but sometimes he’d also go feet-first. Anytime Frank Taveras and Omar Moreno get mentioned in the 21st century, you know it’s a great quote. “Nowadays, I would never try to change a kid. They are conditioned to go headfirst, and it would mean a real change,” said Lopes. “You’d have to work on it on a daily basis. A lot of it would be psychological. You’re taught that when in doubt, slide. But you don’t want somebody thinking in the middle of it, ‘Do I go feet-first or headfirst?’ You’d have to work with them, have their cleats off so they aren’t worried about catching a spike and rolling over and breaking an ankle. What do you think? Should Reyes — and other players — continue to go head-first or feet-first? Battle it out in the comments. All depends on the player. Lopes here states that he never did it. Some guys are synonymous with it – and rarely had problems. I just think it’s dangerous when it’s “the only way” you’re comfortable — and it’s clear that Reyes really prefers to go in this way without giving a feet-first approach much of a second thought. Sliding head-first might feel “more natural” to him, where he thinks he’s not losing any momentum – stopping up as he goes, etc. . . . . .I can see where that perspective comes in . . . . .
Those kinds of “minor injuries” are easier to play through than pulling a hammy, quad, turning an ankle — but the point remains: you’re doing a number on your body over time.
. . . . . .not to mention if a Ken Huckaby ever gets in the way of you as you’re diving head-first into a bag (referring to the time Jeter had his collarbone broken in Toronto). As someone who’s played a ton of baseball, as a speedster out of the leadoff spot – for the majority of his career — I’m not saying Reyes is “wrong” for going in head-first all the time. I’m just saying that as he gets older, he might rethink it a bit more. He’s a professional athlete in tremendous shape; but he’s going to have to modify his game a bit as he gets older. Not everyone is Rickey Henderson. And even Rickey mixed in a feet-first slide from time to time. I already commented in a previous post on this: nothing good comes out of a head first slide. Hand injuries, beaten body, oversliding the base. I didn’t see it but I heard Coco Crisp overslid the base twice this past weekend sliding head first. Over the last years I remember at least two occasions where David Wright had second base stolen but was out since he couldn’t get to the bag since the second baseman/shortstop just dropped down on the bag and blocked him. When the defender doesn’t even have to consider incoming spikes this will happen all day long. This is something that needs to be taught at the low minor league level. The team should “ban” it in the minor leagues and force the kids to learn to do it right. Eventually Reyes will tear a ligament in his fingers. This does make it tough to give Reyes huge money knowing that at some point he will miss extended period of time. Yes. Someone like Reyes, he isn’t going to suddenly stop unless some major thing happens and maybe not even then. Regarding those who don’t slide much, especially high profile players, coaches and managers should send a message. The chance that key players will be out for long periods is not a good risk to take. But, Reyes types have done it too long to change very easily. If your objective is to take the bases you should take, and not get hurt, then yeah, slide feet-first or not at all. If your objective is to push the envelope and steal some bases where every millisecond counts, a proper head-first slide gets you there fastest. “Proper” meaning you hit the bag while going full-speed, and almost slide past it, rather than hitting the dirt and skidding into the bag while decelerating. Reyes is very, very good at this. Yeah, infielders can hurt you when you do this. Maybe weight train your neck like a football player, so you can bulldoze through like Rickey did? If we’re gonna spend minor league instruction time on sliding, bring back the hook slide!